Capra Mineral Whey™ is a high quality mineral rich product that should not be considered if you are looking for a goat milk protein product. While there is a small amount of whey protein in Capra Mineral Whey™ it is intended as a mineral replacement product rather than protein supplement. For a goat's milk protein supplement please see CaProtein. Mount Capra goats are free range, allowing them to enjoy life the way nature intended. Their food supply is free of pesticides, herbicides, growth hormones and they are not treated with antibiotics. This laid back lifestyle and food quality is captured in the gentle and unique production methods and transferred into Mount Capra products. 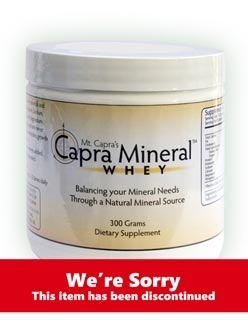 Note from the manufacture Mt.Capra Wholefood Nutritionals : Capra Mineral Whey is very hygroscopic which means it may clump. Whilst this is not an ideal presentation and means one may have to break it up, it does not affect the quality of the product. The product is still perfectly fine. Maintenance use: 1 tbsp (approx 10g) in a cup of water or on food, twice a day. Capra Mineral Whey™ is a high quality mineral rich product that should not be considered if you are looking for a goat milk protein product. While there is a small amount of whey protein in Capra Mineral Whey™ it is intended as a mineral replacement product rather than a protein supplement Mt. Capra goats are free range allowing them to enjoy life the way nature intended. Their food supply is free of pesticides, herbicides, growth hormones and they are not treated with antibiotics. This laid back lifestyle and food quality is captured in our gentle and unique production methods and transferred into the products.